in preparation for the holidays (and my pending trip home to the u.s.) i’m attempting to eat healthy just so that in 3 weeks i can gorge myself with holiday goodies + the american food i’ve dearly missed since moving overseas. however, while i mainly miss the cuisine — there are still some american treats that i get here down under such as oprah, the kardashians and episodes of two & a half men every time you turn the tv on. we also get the today show… though it’s a bit of a jump ‘back in time’ (as huey lewis would say) as the monday episode airs tuesday here because of the time change. today’s show had a great segment on homemade gifts on the sweet side. peanut brittle, truffles, handmade packaging + more! 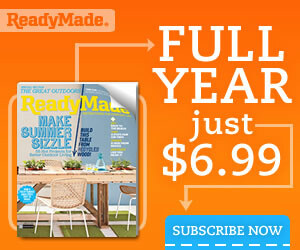 for all the lovers of ReadyMade (or those of you that need a prompt introduction) – take up a special 1 year subscription offer for only $6.99! non-u.s. residents, i believe they are open to international orders… shoot them a note. it’s an AMAZING magazine for any D.I.Y. fan. their tagline… ‘instructions for everyday life’. seeing that the last post was from ‘not martha’… i started thinking about ‘yes martha’… now let me explain. while the northern hemisphere has officially moved into fall, here in the southern hemisphere – summer couldn’t be more at the forefront of everyone’s mind. last weekend we moved the clocks forward for daylight savings and now the weather has officially switched from ‘jackets w/ the windows closed’ to ‘no jackets w/ the warm sun on your arms outside in the thick of it’. 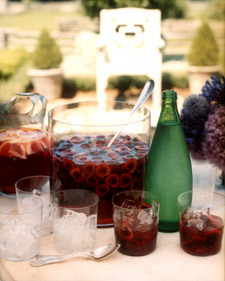 and with that, my mind goes to cocktails – one of my favorite things about summer. now the recipe that I am about to share with you, can be for summer or fall and made with or without alcohol… regardless it is yummy and has stuck in my brain for a few years now since the handicraft maven herself, martha stewart, whipped us up a batch for taste testing at a conference i attended a few years ago. give it a whirl yourself, you won’t be disappointed!